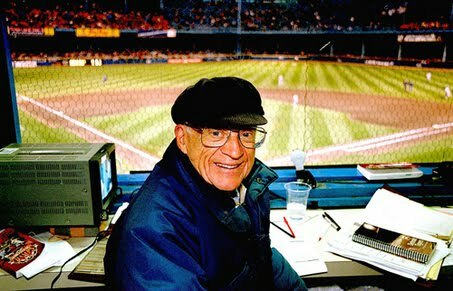 I’m sure over the next few days there will be plenty of blogs about the passing of Ernie Harwell. I’ve written about him before, about the grace he displayed as he was signing off from this world. And I’ve written about how much Mitch Albom has a gift with words that I’ll never have. Ernie Harwell: Gone now, but never forgotten. We knew this was coming. Ernie, in his final grace, prepared us for it. He told us not to worry. We still worried. He told us not to cry. We cried anyhow. He told us he had led the life he’d wanted, that he was ready to say good-bye. I’ll leave the rest to Mitch to say. All I can say is how much I admire Ernie Harwell. Not just for his voice and his talent in calling baseball games, but for the way he lived his life. I have been recently reminded how far short I am from being someone capable of doing the right things. I hope that someday I get myself to the point where I have the courage to be as humble, as graceful, as peaceful, as good as Ernie Harwell. God Bless You, Ernie. I will miss you. Tell my Grandpa that I said “Hello” and may the two of you enjoy the great games you’ll call together from the best Press Box anyone could have.